Of course it was Erwin Zijleman who pointed me to Natalie Ramsay (http://wonomagazine.blogspot.nl/2014/12/fly-to-home-natalie-ramsay.html). How he manages to keep up with lady singer-songwriters from Canada is a mystery to me, but he quite often finds gems like Fly to home is. Natalie Ramsay's Bandcamp page pointed me to other musicians, as those who follow this blog know since yesterday. 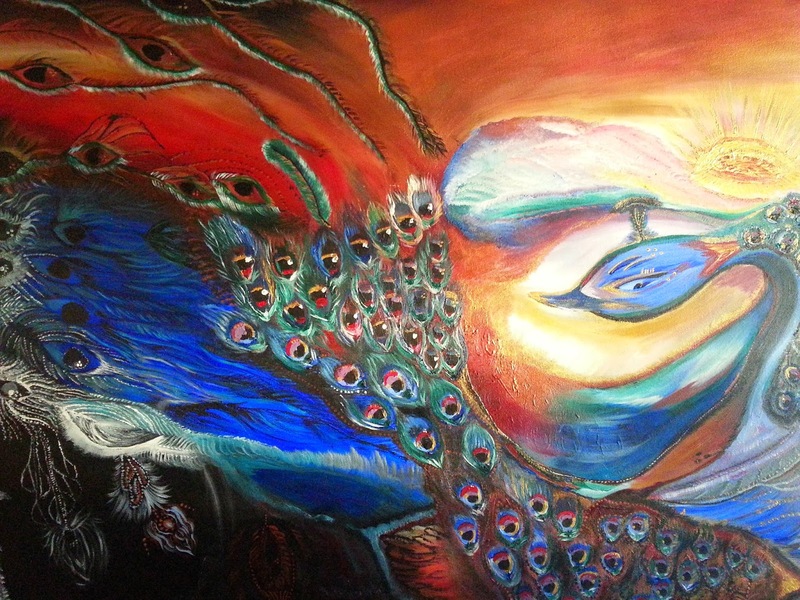 For all others: http://wonomagazine.blogspot.nl/2015/01/cluster-funk-death-goldbloom.html. Death Goldbloom makes totally different music, but its lead musician, Tim Claridge also plays on Fly to home. So the link is easily explained. Whether both are part of the music scene in Vancouver, B.C., I have no way of telling, what I do know is that their music can't be further apart. Fly to home is the work of a singer-songwriter in the folk idiom, with some faint pop injections. One girl, one guitar and from there the music is worked on in different ways. All remains small and often delicate, making a huge impression on me and delves for the shortest route to my heart and mind. Fly to home tickled me in all the right places where this kind of music is concerned. The music set off as many colours in my mind as you can find in the cover art. Probably about all that is. Reading up on the information supplied on the writing of this album, it was not as easy as the album sounds like. 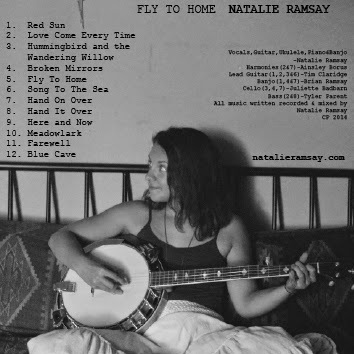 Natalie Ramsay climbed some high hills and descended into deep valleys to come up with Fly to home. The result sounds like it as the album has many highs and loads of depth. No matter how light the accompaniment may sound, all songs have a load on them. The unbearable lightness of being, incarnated. Take 'Broken mirrors' e.g. Nothing is going on musically really, at face value that is and still I have to keep listening. And then the piano is added and a banjo, after which Natalie lets us have it, changing the whole song except for that atmosphere that doesn't let through much light. When the song is over I'm the one who's left behind, feeling low, but happy at the same time I had the chance to get acquainted with 'Broken mirrors'. 'Primal rumble', Gretchen Lohse's album, came to mind a few times when listening to Fly to home, although the latter has a far more solid sound, while it is more vulnerable at the same time. It is this combination that appeals to me most when listening to Natalie Ramsay's music. Her voice is a bit deeper than most female singers, not always 100% pitch clear, giving her voice this little extra. As such she could have sung in the British folk bands of old, but luckily she doesn't put on this extra Sandy Danny or Molly Prior clamour into on her voice for dramatic effect. Simply by keeping her voice low key. This way Ramsay easily has a higher impact on me. The moments she is assisted by Ainlsey Borus, who lays down some beautiful harmonies on this album, the magic gets even stronger. Sparkles all around. As far as I'm concerned a star has born, without the world knowing about it. Natalie Ramsay ought to be picked up fast by more listeners. Whether she is really interested to undergo all that, may be doubtful. Still, in the end she writes herself "I like people to hear my music" and at this stage to achieve that she gives away her music away for your price. That price ought to be stiff as Fly to home is a beautiful, forceful and caring album. An album that can carry you through the day and night, comfort and caress at the same time. Fly to home came too late to my attention to be in my 2014 album list. It should have been in there and pretty high too. As I said, a star has born.